extenuating circumstances, not to live in Israel is removing himself to the peripheries of the struggle for Jewish survival and away from the center of Jewish history. Either/or…sooner or later, today or tomorrow, you will have to decide, Halkin concludes. thought, “Boy we need a new edition of this book.” I am thrilled to welcome this classic – with a compelling, inspiring new introduction by the author. The issues are remarkably relevant, the writing remains fluid, the passion infectious, the insights profound. New generations of readers will be inspired by this, and older generations of readers will eagerly greet this new edition like an old – and long yearned-for – friend. 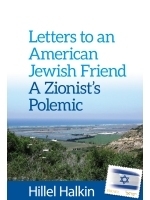 Three and a half decades ago, the appearance of Hillel Halkin’s Letters to an American Jewish Friend sent shockwaves through the American Jewish community. The book was what would become known as vintage Halkin – smart, thoughtful, provocative, unsettling. No one who read it put it down untouched or unmoved. That Letters is being reissued now, making it available to a generation that needs it perhaps even more than the generation in which it first appeared, is cause for celebration, hope and gratitude. A book any Jew concerned with Israel and the future of the Jewish people ought to read….a clear, forceful polemic that will drive every reader back to a careful scrutiny of his own preconceptions about Jewish existence. A polemic, blazing with passion and inventiveness and good humor, a cri de coeur impelled by a fury of conviction. American Jews will be disturbed by Halkin's articulate 'letters' from Israel… His arguments are succinct, intriguing, and deserve the serious attention they have already commanded. With humor, metaphor and passion, Halkin compels a moral confrontation with the alternatives before the Jewish people – ease in a fading Diaspora or unease in Zion. If there has been a more significant Jewish book published in this decade, I haven't seen it.